TORONTO , Nov. 27, 2018 /CNW/ - Continental Gold Inc. (TSX:CNL; OTCQX:CGOOF) ("Continental" or the "Company") is pleased to provide a construction update for its Buriticá project in northwestern Antioquia, Colombia . The project remains on schedule, with expected construction completion and first gold pour to take place in H1 2020. Commercial production ramp-up is still anticipated approximately six months after first gold pour. As of November 20, 2018 , the Buriticá project has reached approximately 44% completion, with mill and surface infrastructure engineering and procurement over 93% complete. Site activities are accelerating; process plant earthworks have advanced in all key areas, including nearing completion for the Merrill Crowe facility, and overall progress stands at 76% complete. Rebar installation is ongoing for the primary crusher and concrete pours have started for the coarse ore reclaim tunnel. Pedestals have been poured for both SAG and ball mills and concrete work continues for mill building for items such as column pedestals, equipment pads and retaining walls. Concrete work is also advancing well for the tailing filters, and rebar installation has started for the CCD and cyanide recovery and oxidation areas. The contractor has been mobilized to begin leach tank erection. Since completing the feasibility study for the Buriticá project in 2016, the Company has been optimizing the mine design and rescheduling development. This work has resulted in a reduction in total pre-production lateral development (horizontal and inclined jumbo development) from 19 km in the feasibility study to 14.3 km in the current mine plan, a reduction of approximately 25 percent. Underground development continues ahead of schedule and is approximately 44% complete. Since the beginning of 2018, monthly advance rates have consistently exceeded planned development and, as of October 31, 2018 , 6,274 metres of lateral underground development has been completed. Crews continue advancing daily at the Yaraguá and Veta Sur ramps and the Higabra tunnel and upper and lower drifts connecting the Yaraguá and Veta Sur vein areas are advancing well. Additionally, definition drilling continues to provide information required for stope design and mine production scheduling. 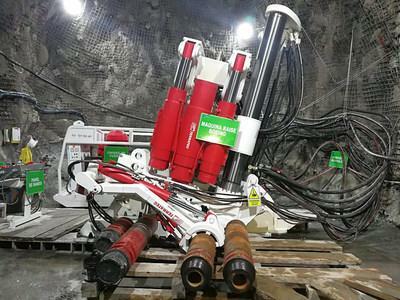 Drill chambers continue to be extracted proximal to planned stoping areas as development advances; monthly definition drilling has been and will continue to increase through the balance of the year and into 2019 as development accesses additional drilling areas. Donald Gray , Chief Operating Officer, noted: "At Buriticá, this is an exciting time for our Continental team, as we are seeing initiatives in a number of areas coming together as planned. Project construction is accelerating. We are moving ahead quite briskly, with numerous construction activities taking place simultaneously and, now that we have selected the project's General Contractor, we will be starting major mechanical installations in earnest in Q1 2019. Also, our underground development continues to consistently track ahead of schedule. We are quite pleased at this point, not only that the project remains on track and meeting corporate objectives, but also with the hard work and spirit of cooperation being put forth by the entire team to help this project advance so quickly." Continental Gold is the leading large-scale gold mining company in Colombia and is presently developing it's 100% owned Buriticá project in Antioquia. Buriticá is one of the largest and highest-grade gold projects in the world and is being advanced utilizing best practices for mine construction, environmental care and community inclusion. Led by an international management team with a successful record of discovering, financing and developing large high-grade gold deposits in Latin America , the Buriticá project is on schedule with first gold pour anticipated during the first half of 2020. For information on the Buriticá project, please refer to the technical report, prepared in accordance with NI 43–101, entitled "Buriticá Project NI 43–101 Technical Report Feasibility Study, Antioquia, Colombia " and dated March 29, 2016 with an effective date of February 24, 2016 , led by independent consultants JDS Energy & Mining Inc. The technical report is available on SEDAR at www.sedar.com, on the OTCQX at www.otcmarkets.com and on the Company website at www.continentalgold.com. Additional details on Continental Gold's suite of gold exploration properties are also available at www.continentalgold.com.